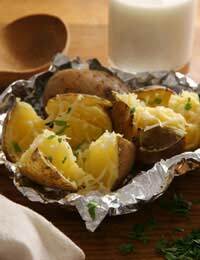 Along with pasta and bread potatoes are probably our most important carbohydrate. We can't get enough of them and this is most likely due to their huge versatility in the kitchen. From chips to mash, they are the perfect accompaniment for so many meals, as well as adding some starchy bulk to soups and stews. So, let's learn how to treat them with the respect they deserve. Despite their ingrained nature in British culture, potatoes actually originated in South America. Sir Walter Raleigh is credited with their arrival in this country in the late 1500s and, whilst they were no doubt viewed as a terribly exotic addition to the dinner table, it took a while for them to catch on. This was largely due to the fact that no one really knew how to cook them and rumours were rife about the poisonous effects they could have, if eaten. However, things improved as knowledge grew and they were found to grow easily in these slightly less balmy climes. As such, they soon became a staple, especially amongst poorer people, as they were cheap and easy to produce and made a filling meal. There are literally thousands of different varieties of potato and it's the starchy tuber that is cultivated and eaten. Different varieties will work better with certain cooking techniques but the main rule of thumb is to choose a floury variety for mash or roast spuds and opt for a waxy variety for boiled potatoes. Choose a floury variety as these work best for mash. Peel the potatoes and cut into even-sized cubes. Place in a large pan of water, bring to the boil and cook until very soft. Drain really well and add a knob of butter and a dash of milk to the pan. Mash until the potatoes are really creamy. There's nothing quite like a baked spud when it comes to comfort food. Preheat the oven to hot. Wash the potato and then prick it all over with a fork. Rub a little olive oil on the potato and sprinkle a little salt over (this helps to make the skin nice and crispy). Place in the centre of the oven, directly on a wire rack so that it cooks evenly all over. Depending on your oven, it will probably take about 45 minutes to 1 hour for your potato to be cooked to perfection. It's easy to make your own oven chips, and healthier too. Peel 2 large baking potatoes and trim the ends so they look slightly square in shape. Cut a thick slice and then cut this into three or four batons, depending on how thick you like your chips. Repeat with the remainder of the spuds and then place the chips in a pan and cover with cold water. Give them about ten minutes then rinse away the excess starch, cover with boiling water and let them simmer for a couple of minutes. Meanwhile, heat a little oil in a baking tray in the oven. Drain the chips well, toss with a little more oil and put them in the baking tray. Cook them on a fairly high heat for about 30 minutes, or until they're golden and crispy. Turn a couple of times during cooking so they cook evenly. There are obviously loads more ways to cook a spud and you'll find more recipes throughout the site. Boiled new potatoes, served with a knob of butter are pretty hard to beat, as is a simple potato salad scattered with fresh chives. You can sauté them, fry them, roast them and griddle them. No wonder most people list them as their favourite vegetable!